Just like birds, gliders can stay in the air and climb by using natural rising air currents. There are many different causes of lift, some generally associated with hilly or mountainous terrain, but in East Anglia we mostly see thermals. A thermal is a bubble of warm air created when the ground is heated by the sun. The bubbles rise and at its top usually creates a small puffy cumulus cloud. 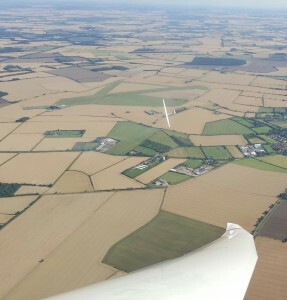 With practice, a pilot can recognise a thermal and fly in a circle within the thermal to gain height. Once the glider has climbed in can then fly on to the next thermal, and repeat the process, using thermals as stepping stones in the air. With the right weather conditions, it is possible to stay airborne for many hours and travel hundreds of kilometres using only thermals to stay aloft.